1 of 3 Heat a large pot of lightly salted water to boiling. Add broccoli to water and cook 3 minutes. Scoop broccoli from water and transfer to a 12-inch skillet, along with oil. 2 of 3 Return water to boiling and cook pasta as package directs. Drain and transfer to a serving bowl. Toss with butter, 2 tablespoons of the lemon juice and the garlic salt. Keep warm. 3 of 3 Meanwhile, heat broccoli and oil over medium-high heat until sizzling. Add garlic and shrimp. Cook for 3 to 4 minutes, or until shrimp is cooked. Add remaining 2 tablespoons lemon juice, salt and pepper. 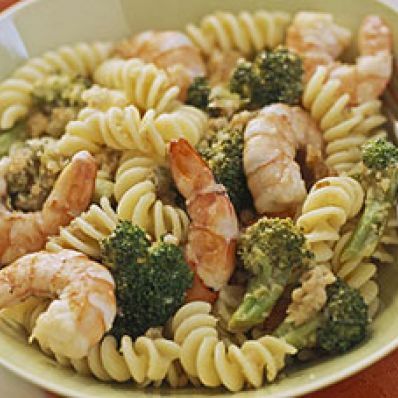 Stir in bread crumbs and serve over rotini. Per Serving: 10 g Fat, total, 427 mg sodium, 129 mg chol., 42 g carb., 3 g fiber, 3 g sat. fat, 340 kcal cal., 21 g pro.